I'm certain this post will shock and disgust most of the readers. However, it demonstrates a worst case scenario if feral colonies are left, wild, to their own sustentation. It also underscores the importance of cat caregivers, who not only sustain feral colonies, but make sure that the felines are sterilised. "I am not sure if 'environmentalist' is the right title for Mr. Green. Besides what I see to be his passion for animal fur, there are more humane methods to curb the feral cat population." The Sydney Morning Herald 21 Febaruary 2016: You won't find Kangaroo Island's Catman on the tourist brochures but ask any local and they'll point you in the right direction. First, turn off the main road to American River down a gravel cul-de-sac and look for the gently swaying skull (wallaby and kangaroos) mobile. Past a ragtag collection of gnomes sheltering beneath the 'beer tree' (a dwarf pine festooned with hundreds of upended aluminium tinnies) you'll spot the hand-painted sign above the door that makes it pretty clear you're in the right place: Feral's End. 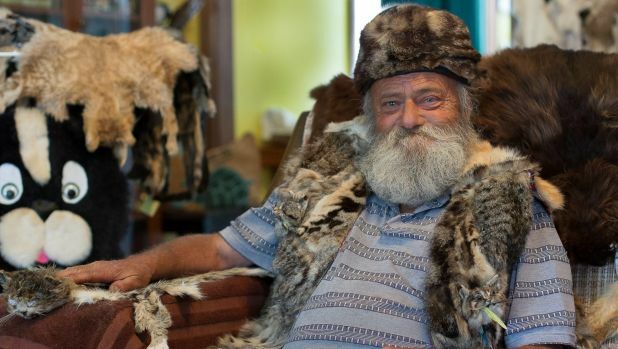 It's the home of Barry Green, a twinkly eyed, grey-bearded 64-year-old environmentalist, who has been trapping, skinning and tanning the...read on.